After graduating from Sainte Pulcherie French School, in 2009 Nesya Küçük started her undergraduate education at University of Koç. She received her bachelor’s degree on Psychology. During her education, she assisted to Dr. Aylin Küntay, who is the director of Language and Communication lab at Koç University. 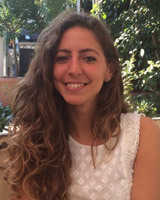 To support the theoretical knowledge she gained in her undergraduate years, she did several internships in Ekip Norma Razon Children, Youth and Family Counseling Center, Süper Çocuk Evi, Yankı Yazgan Güzel Günler Health Services, Nova Private Education, and Nadis Education and counseling Center. In 2013, she went to England to study her Master’s degree in Clinical Psychology at University of Sussex. She prepared her thesis on the mechanisms playing role in the transition of anxiety from parent to child. In the summer of 2014, she returned to Turkey and joined the team of Günışığı Child Center.